Gordon has worked in the design industry since graduating from St Andrews University in 2002. He has worked in Aberdeen and Glasgow for leading design and media agencies. 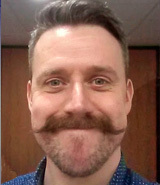 He moved to Midlothian in 2013 taking up the role as web and graphic designer for the University based at Easter Bush Campus, providing design services for the Vet School, the Animals hospitals and the Roslin Institute.